This is not an easy knitting poncho pattern, but I wanted you to see what can be done with a bit of practice. 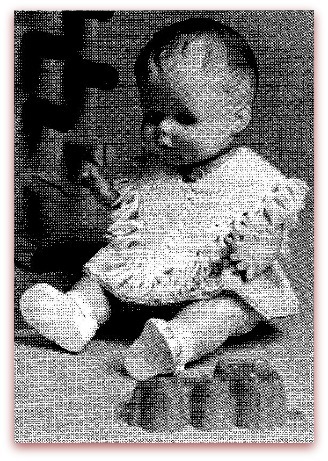 Below you will find a pattern for a Loom knit pattern for a child and a hand knit pattern for a doll. 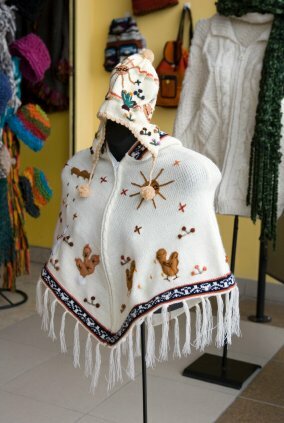 This knitting poncho pattern is one I adapted for the loom. I found the original pattern on a Bernat leaflet hanging at the yarn store display. Of course it was originally knit on needles. 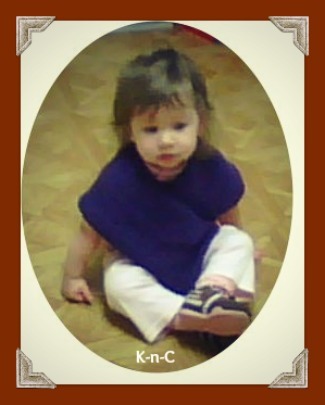 I wanted to make this up for my grand daughter. Since I knit much faster with the looms I decided to use one of them instead of the needles to make this a quick project. If you are looking for an easy and quick gift, this is perfect. 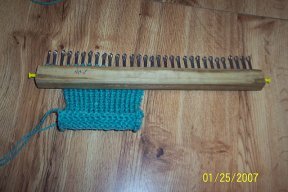 This was knit on my homemade loom we call our Po' Folks Loom</b></a>. You can use any small gauge loom that has at least 31 pegs. The yarn I used was regular Lion Brand Wooleze. This pattern is so easy to make up and is a great project for beginners. There are just two panels to make and each one will be about 6 inches wide. 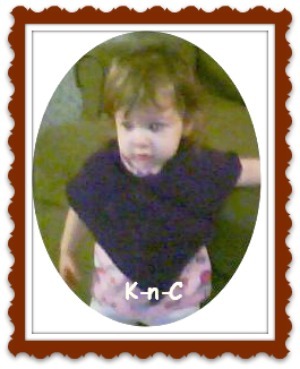 This poncho fits a 12 to an 18 month old. It only required about 3 oz of yarn. Repeat rows 1 and 2 until piece measures 17 inches. It should be about 98 rows when panel is finished. Make two panels like this and put together as the diagram shows. Stitch ends (A) to (A) and (B) to (B). Use variegated yarn for an easy design pattern. 1 (50 gram) ball Patons Fairytale 3 Ply Courtelle/Bri-Nylon. Pair No. 12 Milward Disc needles. To fit 12-inch (30 cm) doll. 16 sts. and 20 rows to 2 in. (5 cm). Start at lower edge by casting on 59 sts. and K. 2 rows. 1st row—Right side facing, P.1, (K.1, P.1) 14 times, K.1, mark this stitch with coloured thread as centre st., P.1, (K.1, P.1) 14 times. 2nd row—(P.1, K.1) 13 times, P.3 tog., P.1, P.3 tog., (K.1, P.1) 13 times. Continue in Moss-stitch, keeping centre st. in stocking-stitch and decrease 2 sts. as before on each side of centre stitch on every alternate row until 27 sts. remain. Cast off. Make another piece the same. Do not press. Join side seams. Fringes—Cut remaining yarn into 2 in. (5 cm) lengths. Taking 4 strands together each time, knot a fringe round lower edge.